Info "Blow away. The dandelion fluff. Do not be concerned if you see a butterfly. Just blow." 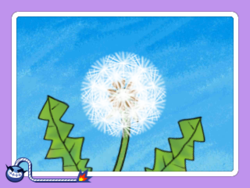 Make a Wish is one of Mike's microgames in WarioWare Gold. The player must blow into the mic to blow away some dandelion seeds. 1st level difficulty: No butterfly appears. 2nd level difficulty: A butterfly stands on the dandelion. 3rd level difficulty: A butterfly stands on the dandelion and blowing it reveals an old man. This page was last edited on March 11, 2019, at 18:17.